The Kimball Family: Four Boys and a Girl: WELCOME TO US! Hi there, after a fun weekend getaway with the girls, I became convinced that this would be my thing - so here is my BLOG! 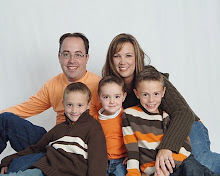 My name is Kathy Kimball, I am married to a wonderful husband, Jory, and have been for ALMOST A DECADE!! 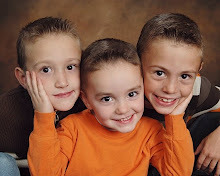 We have 3 beautiful boys, Jonah (6), Eli (4), and Jax (1). We live in a suburb of Salt Lake City, where we will live for eternity (Salt Lake, at least). Jory's whole family is here, and he has built his optometry practice here, so here we will stay. It is the day after our neighborhood's fun scrapaway retreat, so I should probably go put my MOM hat back on, but I will return! !